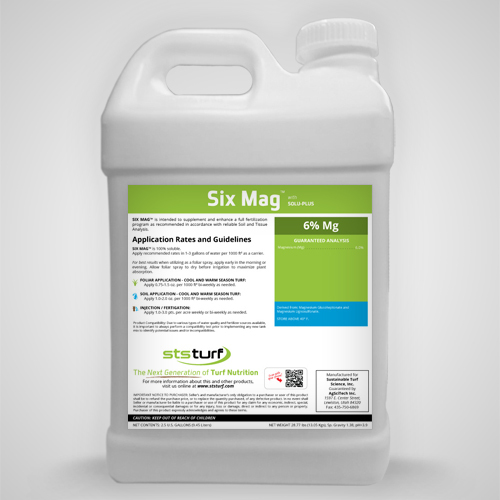 STS Six Mag contains two high quality, super hydrated sources of Magnesium to prevent precipitation. This product in the line of “Next Generation” products, can be applied as a foliar, sprayed and watered in for root uptake, or injected through your irrigation system. STS Six Mag is complexed and chelated with organic and amino acids to ensure immediate availability. Our proprietary pre-digestion process provides low molecular weight complexing and chelating agents that stop the electro-magnetic attraction between positive and negative charged elements. This process maintains nutrient availability, enhances turf absorption and root uptake. Multiple vitamins, enzymes and organic acids compliment the Magnesium, to conserve plant energy, maximize utilization and extend plant health benefits. Injection/Fertigation Rate / Acre 1.0 - 1.5 qts.